Lili grew up in Sonora, Mexico and recently graduated from UC Berkeley. While at Berkeley, she studied Business Administration at the Haas School of Business. Valerie Wong, a Vice President at BlackRock and former President of Latinos in Finance, was her mentor during the mentorship program. With the help of Valerie, Lili was able to stay focused on her professional goals—such as organizing the “Stay Hacking with the Dream Resource Center.” In the words of Lili, “Valerie Wong continues to be an inspiration as she is one of the most successful women who also does amazing work for the community who I have met.” In her free time, Lili enjoys arts & crafts and trying new foods. Sandra grew up in Riverdale, CA and is a rising senior at UC Berkeley studying Applied Mathematics in Probability. Ariadne Valadez, former President of Latinos in Finance and current student at NYU, was her mentor during the program. With the help of Ari and the mentorship program, Sandra was able to secure an internship at Wells Fargo’s Investment Portfolio’s Group. In the words of Sandra, “Special shout out to Ariadne Valadez for the endless support and opportunities she has provided to me. I'm endlessly grateful for all of the friendships and opportunities LIF has provided.” In her free time, Sandra enjoys fitness and photography. Duane grew up is Jacksonville, FL, graduated from the University of South Florida in December 2017 and is now an Investment Portfolio Analyst at Wells Fargo. Ivan Magana, a Fixed Income Trader at Wells Fargo, was his mentor during the mentorship program. With the help of Ivan, Duane polished his interview skills, met many professionals within the industry and received tips on how to maneuver his career. In the words of Duane: “Ivan Magana has an incredible amount of expertise that allowed him to guide me through the struggles I was having early in my career.” In his free time, Duane plays basketball and enjoys hiking. 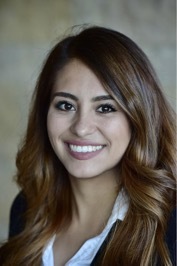 Esmeralda grew up in Boonville, CA and is a rising senior at Cal State, Sacramento studying Finance and Risk Management. Janeth Medina, AVP at Bank of the West and sitting President of Latinos in Finance, was her mentor during the mentorship program. With the help of Janeth, Esmeralda secured an internship at Bank of the West. In the words of Esmeralda, “It felt like I knew my mentor since the first moment we interacted. Janeth's entrepreneurial spirit, vision, and genius have driven me to constantly seek for growth and knowledge. I truly thank LIF for being part of my professional development and for making a difference for students.” In her free time, Esmeralda enjoys cycling and planning trips.